Not long ago, I posted a beautiful anime-style short. Following a trail from Twitter, I was led to the site where it was featured, and to my surprise, it was Rober Ebert’s website. But, I was only surprised for a second – after all, the nation’s leading film critic (and the first to ever win the Pulitzer Prize) has championed anime for many years and Anime News Network has described him as a closet otaku. He even wrote an article entitled “The Beauty of Anime.” In fact, aside from John Lasseter, there’s likely no more powerful voice for anime in U.S. mainstream culture. Roger Ebert should be familiar to most of you. Forbes called him American’s #1 pundit (and in the Internet age, that designation is no small feat). Then again, maybe I recognize him better than most because I religiously watched “At the Movies” as a child, wanting to weekly see him duke it out with his first partner, Gene Siskel. Later, I continued to watch (and then read) because I realized: a) I agreed with him much more than not; b) even when I didn’t agree, I learned something from his reviews; and c) his writing is clear, calculated and wonderful. Even if you’re not familiar with Ebert, you certainly are with his (official) trademark of the “thumbs up” and “thumbs down,” regarding movie recommendations. When anime fans say how good the film is, nobody takes them seriously. Now that it’s available on DVD with a choice of subtitles or English dubbing, maybe it will find the attention it deserves. Yes, it’s a cartoon, and the kids have eyes like saucers, but it belongs on any list of the greatest war films ever made. If you have never seen a Japanese anime, start here. If you love them, “Metropolis” proves you are right. When his movies are working and on those rare occasions when they are not, Miyazaki nevertheless is a master who, frame by frame, creates animated compositions of wonderment. How many people not familiar with anime have viewed the form because of Ebert? I imagine it’s probably a hefty number. In fact, I can’t quantify it, but I believe Ebert had a major hand in the buzz around Spirited Away (from his review) and it’s subsequent good theatrical numbers (for anime in the U.S. at least) that accompanied its wide release. But it’s not just Ebert’s film criticism and enjoyment of Miyazaki that draws me to him. He’s also become a popular tweeter and blogger. And he holds no punches back – he’s as truthful as anyone, caring little about being criticized in return or of losing popularity. And a frequent subject of his blogs is religion. He grew up Catholic, but now considers himself an agnostic. 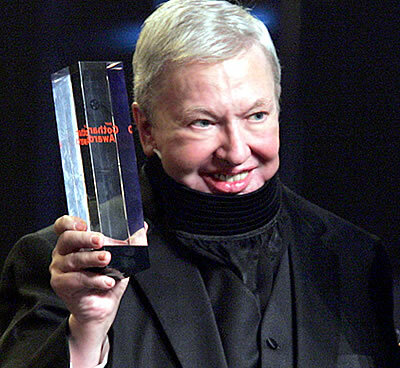 Generally, through reviews and blogging, Ebert is respectful of religion and promotes conversation about faith. His entries on faith are often among the most-commented – this recent one has received over 700 comments. More impressive than the number is the fact that he takes time to often respond to comments. Today, Roger Ebert reviews as many films as ever – this despite spending the better part of the last decade dealing with the effects of surgery for thyroid cancer. Because of the cancer and surgeries, Ebert has lost most of his jaw and can no longer speak (Esquire did an excellent piece on him and his health earlier this year). Through this ordeal, I’ve grown to admire him even more. And I’m thankful that he remains active, and here’s to hoping that despite even recent health issues, Roger Ebert remains a strong voice in film criticism and a continued champion of Miyazaki films and anime. Yeah, I check his site out all the time, also. It’s really become my only movie-destination site. I would love to see him review some other anime…perhaps we’ll get lucky and a Summer Wars review will be forthcoming, though I doubt it. When Summer Wars played in Chicago, I got my hopes up that it would be reviewed in all the papers, but neither the Sun-Times, Tribune, or the Reader bothered to cover it. But skim through the comments on his list of “best animated movies of 2010” and you’ll find lots of readers recommending Summer Wars to him. I know he’s a busy guy, but I’m hoping that he took our collective words to heart.